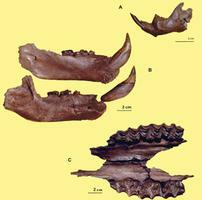 Harington, C. R.. "Ellesmere Island Pliocene Fossils". The Canadian Encyclopedia, 09 October 2015, Historica Canada. 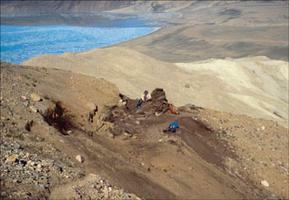 https://www.thecanadianencyclopedia.ca/en/article/ellesmere-island-pliocene-fossils. Accessed 24 April 2019. Toward the close of the Tertiary (5 to 2 million years ago) and the beginning of the ice age (Quaternary - about 2 million years ago), a beaver pond existed on what is now Canada's Ellesmere Island, Nunavut. Vertebrate fossils from the Beaver Pound site: a) small beaver mandible; b) primitive black bear mandibles; c) 3-toed horse mandibles (courtesy C.R. Harington). 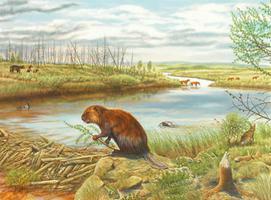 Restoration of the Beaver Pond site as it may have appeared 4 million years ago (courtesy G. Teichmann (artist) and C.R. Harington (scientific advisor). Beaver Pond site as it appeared in 1995. The head of Strathcona Fiord is in the background (courtesy C.R. Harington). Toward the close of the Tertiary (5 to 2 million years ago) and the beginning of the ice age (Quaternary - about 2 million years ago), a beaver pond existed on what is now Canada's Ellesmere Island, Nunavut. The site, which is located near the head of Strathcona Fiord (78°33'N), was discovered by Geological Survey of Canada geologist John Fyles in 1961. It is the world's most northerly Early Pliocene vertebrate locality. The small exposure of peaty, fossil-bearing beds have produced tree trunks up to 3 m long, many beaver-cut sticks (some burned by forest fires), remains of freshwater mollusks, insects, pollen, plant macrofossils (such as twigs, cones and leaves) and vertebrates. These fossils give the first insight into what terrestrial life was like in the High Arctic some 4 million years ago. The vertebrate remains are particularly interesting, consisting of fishes, frogs, birds and mammals, including new kinds of shrew, mouse, a small wolflike animal, badger, horse and "deerlet." Bones most commonly found represent a small, extinct beaver, rabbit, primitive black bear and several members of the weasel family. Many of these species are related to Early Pliocene mammals from the Yushe Basin (about 5 to 4 million years ago) in northern China, and probably reached the Canadian High Arctic before that period via Beringia - a land mass then connecting Eurasia and North America. 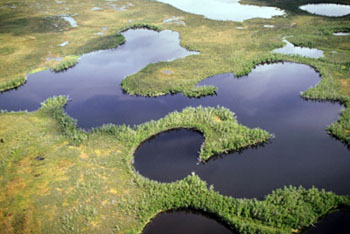 Studies of pollen and plant macrofossils indicate that a larch-dominated Boreal Forest margin habitat with grassy patches surrounded the beaver pond. Fossils of mosses and vascular plants mainly represent wetland species. Analysis of the beetle fauna from the peaty matrix indicates that the site was 10°C warmer than present in summer and 15°C warmer in winter, and isotopic studies of fossil larch support this view. The boreal-forest margin environment of the site is similar to that of the Yukon today. See also Paleontology; Fossil animals; Fossil plants; Ellesmere Island Eocene fossils.